The month of January is usually full of resolutions and thoughts about a new year and new goals. Most people want to lose weight, be a better person, read the Bible, be a better friend, write that book that we’ve always wanted to write, to exercise, the list goes on. I love the start of a new year. The cold air whispers hope into my mind that swirls with new possibilities and ideas. I have longed for the last few months to make a new start with a right focus. I have been so distracted. I have spent valuable time on social media that should have been spent on more meaningful pursuits. I have spent time watching random YouTube videos that both dull my mind and make me feel mildly like I’m missing out on life somewhere else while I miss out my life right here and right now. I have avoided dealing with painful emotions and stress by eating and watching Netflix instead of sitting down, studying my Bible, writing, and praying. I have muted my struggle with self-image by purchasing new, “exciting” items that give me a rush when I buy them that wears off within days. While Husbandman and I were on Christmas break, we watched the documentary “Minimalism” that sparked a lot of conversation. (I’m so thankful that we both work in higher education and get such generous breaks.) The movie follows two men and their associates who have dedicated their lives to sharing their journey to actively pursuing less in a quest to find satisfaction in their own lives. According to their website, “Minimalism is a tool to rid yourself of life’s excess in favor of focusing on what’s important- so you can find happiness, fulfillment, and freedom.” (source: https://www.theminimalists.com/minimalism/). They say that they’re ultimately pursuing happiness while they work to keep their material possessions to a minimum of the most useful tools. At first glance, that sounds perfectly sane. Happiness is nice. I like being happy. Who doesn’t want to be happy? In her book “The Life Changing Magic of Tidying Up: The Japanese Art of Decluttering and Organizing”, Marie Kondo encourages her readers to discard items that don’t “spark joy”. Possessions “sparking joy” sounds great. But is the root of true happiness or even joy what I possess or what I do not possess? Is it seeking my happiness? Minimalism and decluttering to pursue happiness joy on the surface sound Biblical. Christ Himself didn’t put effort into accumulating material possessions but trusted God to provide for His daily needs. But in modern-day culture, the main impetus of minimalism seems to be on wanting less things in order to live a more personally fulfilled life. That fulfillment is still self-centered. These are not inherently bad things, but they encourage people to pursue their own happiness and satisfaction outside of Christ. My greatest calling isn’t to pursue my satisfaction, even if that comes from service to others. I am to love God with all I am, and to love my neighbor as myself. I am, however, not exempt from living a personally intentional life. As a Christian, I should be careful in my consumption of financial and material things; not dulling my senses to the emotions and needs of others and myself. So how do I pursue a life that honors God and doesn’t fall into the trap of minimalism for self gratification? That’s my plan. That’s what I want to pursue this year “out loud” with you all: examining the motivation of my heart in light of God’s truth as I seek to live with minimal distractions. There is so much joy in pursuing the Lord. There is so much freedom. As John the Baptist said about Christ when discussing his role in Christ’s ministry, “He must increase, but I must decrease” (John 3:30, ESV). When I’m in the depths of grief, I need reminded that God loves me. I need reminded of my faith; of the sacrifice Christ made for me when He died on the cross. I believe with my whole heart that God chose to allow His only Son to die to pay the penalty for my sins. His only Son. I never thought I would, but I know what it’s like for my only child to die. I know how badly it hurt that Cora died. I know some measure of the pain that God experienced when He allowed His only Son to die for my sins. And knowing that God knows how I feel comforts me. The reminder that God is still sovereign and that I am still His comforts me. And I pray that you know that comfort as well. I pray that you know that no matter what is going on in your life that Christ died for you, and that all you have to do to know Him is to accept that gift by confess that He is Lord and that you have fallen short. How deep His love is for us indeed. Throughout the month of October, I’m writing a series titled “Hopeful Grief” with a fabulous group of writers, doing the Write31Days challenge. To catch up, or see new posts, click here. Interested in last year’s Write31Days posts? Click here. Know someone that this series may touch? Share as you see fit. You can also sign up to receive notifications when I post something new, using the link to the right. If you’d like, you can sign up for extras too, such as exclusive newsletters and personal updates, by using the “Click Here” button to the right. Want even more? Connect with me on social media. The song “Oceans (Where Feet May Fail)” by Hillsong United has been popular since 2013. The song feels good to sing, and when you listen to it on the surface, it feels good to hear as well. Asking for God to take you “deeper than my feet could ever wander” is asking to get thrown in water that is too deep for you to handle. It’s asking to get placed in water that will drown you if your focus is not correct. Think of Peter in Matthew 14:22-33. Peter tells Jesus to call him out on the water with him “if that is You”. Jesus said to him, “Come” and Peter stepped out on the water. Peter then noticed a “strong wind” and began to sink. He stopped focusing on Jesus. That is what happens to us when we mourn and take our eyes off Christ. The wind is blowing pretty heavily in my life right now. My stress level is high, and the rest of my life feels like it hinges on test results that have yet to come. Will I be able to have another baby ever? Do I have an illness that will affect me forever? I am having a difficult time. Have I told you that? I’m a mess. I’m having a hard time. And when I take my eyes of Christ, I start to sink. I start to flail around and become so frightened that I’m paralyzed. Every day this happens to me, usually multiple times a day. What if something else bad happens? What if I start to feel more overwhelmed. What if? When we ask Christ to call us out on the water with Him, may we remember that it isn’t “safe”. It is not within our comfort zone. When we’re called out on the water and we’re scared, may we remember that Christ is still good, even when we feel like we’re in over our heads. And He is right there when we cry, “Lord, save me!” like Peter did when he began to sink. May our faith grow as our trust grows. May we remember that trust doesn’t grow without the opportunity to trust more and more as God takes us out of our comfort zones. When my feet fail, like they do daily, may I turn to Christ. I can’t continue with Cora’s birth story without taking a day to pause and express my deep gratitude to the people who worked so hard when I was in the hospital to make sure that I was physically healthy, and that I was as comfortable as I could be. We’ll be back to the remainder of her birth story tomorrow. The nurses that served me while I was in the hospital made such a difference in the days and nights surrounding Cora’s delivery. They went above and beyond their job descriptions to help ease as much of the pain as they could during the darkest days we’ve walked through, and will forever help us remember our time in the hospital as one in which we were surrounded by gentle, understanding care instead of cold efficiency. I have always respected nurses, and my job is to help nurses as they work on higher education. But, this experience gave me a whole new level of respect and admiration for your heart to serve, and for the difficulty you deal with every day. I want to thank you, for doing such important work that is easy to gloss over. You saw me suffering, and did your best to physically ease my pain. Thank you. You saw me cry, and took time to talk with me instead of going on to the next thing (of many) that you had to take care of. Thank you. 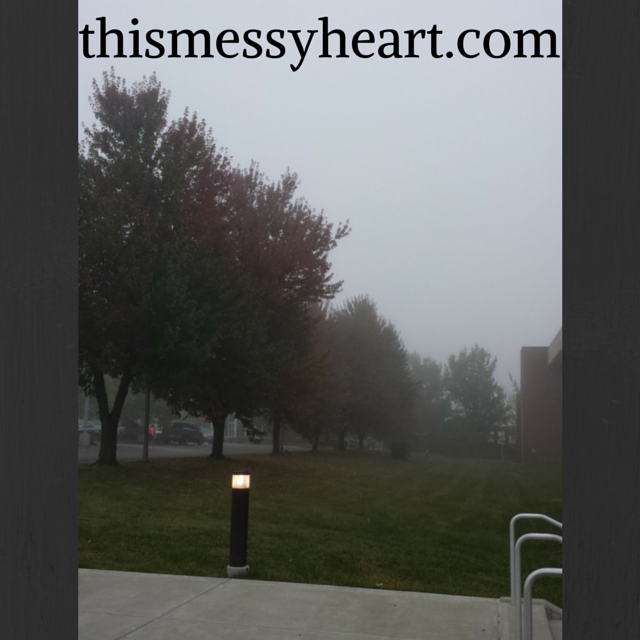 You spoke with me about God’s provision in times of great loss when I couldn’t sleep. Thank you. You watched over me while the doctor tried four times to get my epidural right, reassuring me that it would be over soon. Thank you. You held my hand while I was delivering my little girl after she died, and told me that I was doing a good job. Thank you. You dressed my daughter after she was born, and took so much care to make sure we carried good memories of her with us for the rest of our lives. Thank you. You took pictures as my family and I held her for the first and last time, doing your best to capture memories that we will treasure forever. Thank you. You helped make molds of her hands and feet, of her fingers, and prints of her feet so that we could have tactile memories of her life. Thank you. You cried after she was born too, when I couldn’t see you. Thank you. You helped me walk to the bathroom when my legs were unsure after my epidural. Thank you. You made a special request for the next nurse to take care of me, making sure that I was with someone kind when I was vulnerable. Thank you. You called to check on me after your shift was over. Thank you. You brought another bed into my room so that my husband could sleep next to me when I needed him close the most. Thank you. You came into my room to make sure I was still alive when my pulse was in the high forties while I was sleeping. (Which I guess is normal for me.) Thank you. You were careful to not wake me up if you didn’t have to when I was sleeping. Thank you. You asked if I wanted bacon for breakfast, because who doesn’t like to eat bacon? Thank you. You called the funeral home to help us make arrangements for our daughter. Thank you. You told my family how to take care of me before I left. Thank you. You got Mom and Husbandman caffeine before the drive home. Thank you. You hugged me right before I left, and told me that I would be back one day to deliver a healthy baby. You made sure that my last memory at the hospital was one of encouragement. Thank you. You checked on us after we left the hospital, and still think of us today. Thank you. Thank you for taking care of me. Thank you for acknowledging my pain and honoring my daughter’s short life. To nurses everywhere, thank you for the work you do. Thank you for working so hard to care for your patients physically and emotionally. Please feel free to share this post with the nurses who have made a difference in your life. 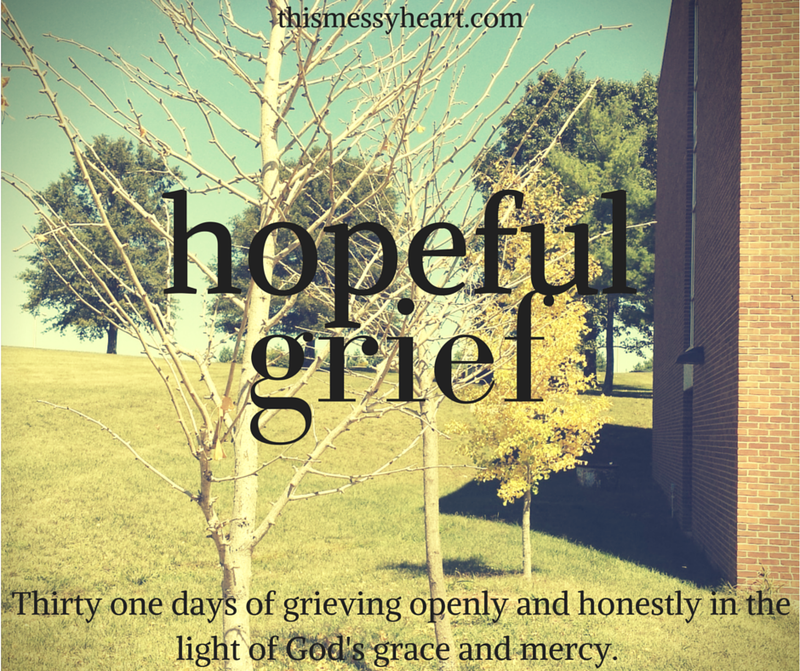 Throughout the month of October, I’m writing a series titled “Hopeful Grief” with a fabulous group of writers, doing the Write31Days challenge. To catch up, or see new posts, click here. Interested in last year’s Write31Days posts? Click here. If I were a tree, and the years of my life were measured by rings, this year’s ring would be dark and jagged, betraying a fire in my life that has left an undeniable scar. I don’t yet have all the words to describe the pain and sorrow that has beaten me like waves on a small pebble, throwing me to the left and right. I may never have accurate words, but what I have, I choose to share. Even as a pebble is thrown around by waves, it is smoothed. The rough edges are removed, and the pebble becomes a treasure for a small child combing the beach. When a tree goes through a fire, unhealthy growth is burnt off, and the tree is able to put its strength into growing up instead of maintaining useless growth. The dark ring gets covered by new growth, and eventually becomes a point of beauty and interest in the tree’s history. On August 5th, my heart was broken and will never be the same. Husbandman and I found out that our baby, Cora Lorraine, had died in my womb before she got a chance to take a breath on her own. I was seven months pregnant. This month, I am joining a host of fabulous writers who are writing every day in the month of October. (To see my posts from last year, click here.) As we approach what was supposed to be her due date, I will share her story, process my grief “out loud” with you, and offer encouragement that there is hope, even through the loss of a child. Although it is my prayer that you, my precious reader, never have to know the feeling of stillness in a full womb, you may experience this pain through your own loss or the loss of a loved one. According to the American Pregnancy Association, anywhere between 10% and 25% of pregnancies end in miscarriage. One in 160 pregnancies end in stillbirth. I am no expert in dealing with grief, and I am not far removed from my grief. But, I am committed to sharing this pain with you, in hopes that my baby girl’s life will continue to honor God. My prayer is that your heart would be moved to worship God because of her life, and that you would be encouraged to speak about your own loss or fear of loss if you feel so moved. My prayer is also that those who surround a family going through loss would feel the freedom to support them, and would recognize that grief for a loss of life at any stage is just as true and as real as grief for a person who walked the earth on their own. Come back to this post every day this month for a link to a new post. You can also sign up to receive notifications when I post something new, using the link to the right. If you’d like, you can sign up for extras too, newsletters and personal updates exclusively for those who sign up, by using the “Click Here” button to the right. You can also connect with me on social media, using the buttons to the right. May you be encouraged in your own grief. May we all see God as good, even when we are in pain. May we praise God all the days of life, because one day in His presence is better than thousands elsewhere. The past couple of weeks have found me looking over my shoulder at God and asking “are You still good?” Over and over again, I have questioned Him. I have looked at Him and said “this really happened. 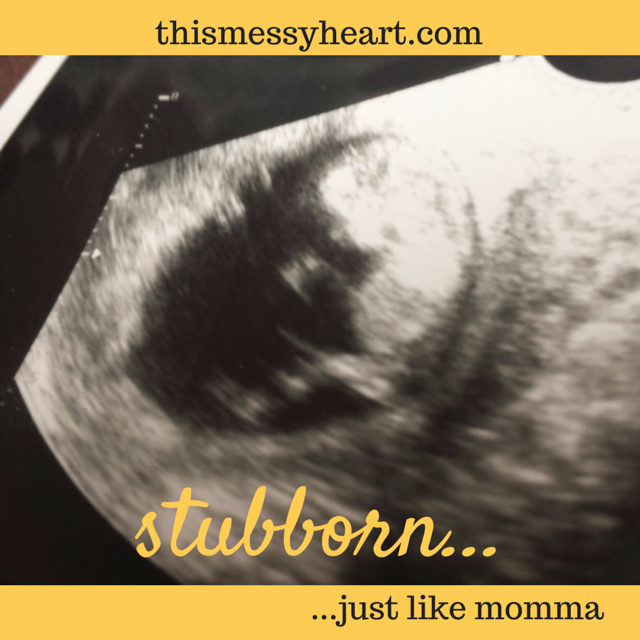 My baby is gone and I won’t be giving birth in November. I won’t have a tiny to take care of this winter. My only birth experience was met with silence when my baby was delivered. I wake up every morning and she’s still gone. Are You still good? Are you still the same God that I knew before she died? Why did you take her from me so soon?” I see and talk to my friends whose lives keep going, who have children and whose babies are healthy and alive, and I ask God “are You still good to me? Are you still in control? Are you still a loving God? Are you a maniacal God who pulls strings and plays heartless chess with my life, or are you the God whose Son ate with sinners and welcomed children? Why did You allow this to happen?” And I’ve not hidden these questions. I’ve asked them out loud. I’ve asked them of God, and some that I love know what I’ve been asking. And they’ve been gracious enough to remind me that God is big enough for questions like that. Husbandman and I have been going to a study meeting at a local church called Griefshare, a group focused on Bible study and support in the wake of loss. And this past week, most of the scripture in the study focused on the Psalms and Job. For those of you who aren’t so familiar with him, Job was a man who had it all and was right in eyes of God. He didn’t have a secret sin or hidden life. He didn’t “deserve” punishment. And Satan came to God and asked for permission to test him. And God said yes. Job lost everything. His home, health, livestock, and his children. And Job spends the majority of the book in the Bible working through what’s happened. Asking “why”. I’ve always loved the end of Job. God spends so much time telling Job who He is, what He’s done. But in our Griefshare meeting this week, we talked about what God didn’t tell Job. He didn’t tell Job why everything that had happened to him was happening. Job asked “why”, and God didn’t tell Him. 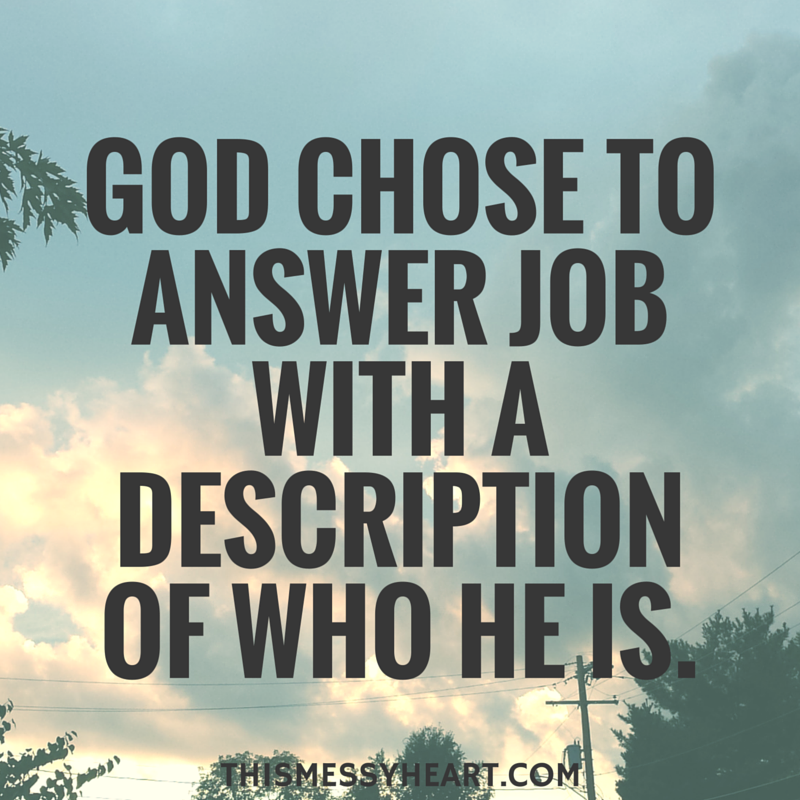 God chose to answer Job with a description of who He is. With a display of His power. With knowledge of who He is. But not with why He allowed any of the things that happened to happen. As we’ve lived our lives after losing Cora, I have spent a lot of brain power thinking about what happened. Trying to figure out what caused her to die. I may not ever find out. But, I thought we’d know what we could by now. It’s been seven weeks since I delivered her, and we still have no idea what happened or if we’ll be able to find out. It seems like I’ve been waiting for test results my entire life. And it seems like I’m in the cruelest holding pattern for a planner that ever was. I don’t know what caused this to happen, much less why, and I can’t plan. I don’t know what the doctors will say. I don’t know whether or not, when and if we’re ever ready, we’ll be able to try to have a baby again. Couple that with the fact that we’ve just suffered such a big loss, and I feel like my brain and heart are going to explode at the same time every day. And I question God. And He meets me with Himself, not with the answers I want. And I ask Him, again and again, “are You good?” And His response is, “I’m here.” And I have to chose to trust Him. Every day, I have to make that choice. It’s harder than it was before. It’s harder than before my baby girl died. Because I know what pain is. And then I am gently reminded that God’s only son died, too. And that He knew that His son’s death was the only way that I could be redeemed, and that He chose to let it happen. God knows the pain of losing His only child. So today, I chose to trust that God is still good, because I am redeemed. Because He chose to save me. And tomorrow, I’ll have to make that choice again. And the day after tomorrow, and all the days after that. So, as I squirm, He is still here. He is still God. And I am not. May we remember that God is good even when we suffer unimaginable loss, and may we be set free in Him. May we resist the urge to put forth a perfect image, denying the fact that God is molding us with pain just as much as with joy. Notice that everything is yellow. Just like me. I am not in control of this tiny person. The Bean is already a person, with likes and dislikes and a personality. The Bean already likes coffee, as evidenced by the wiggles I feel after I drink my allotted 8 ounces a day. The Bean likes cold water, and when I bounce around in the pool. The Bean likes bluegrass music, and kicks me when I turn it off because he or she just can’t get enough. The Bean loves their Daddy (maybe his name will also be Daddy-Man in addition to Husband-Man), and the silly songs he sings. The Bean hates it when I get upset, and let’s me know that I am making their house uncomfortable and that I need to calm down. 1 O LORD, you have searched me and you know me. 2 You know when I sit and when I rise; you perceive my thoughts from afar. 3 You discern my going out and my lying down; you are familiar with all my ways. 4 Before a word is on my tongue you know it completely, O LORD. 5 You hem me in–behind and before; you have laid your hand upon me. 6 Such knowledge is too wonderful for me, too lofty for me to attain. 7 Where can I go from your Spirit? Where can I flee from your presence? 8 If I go up to the heavens, you are there; if I make my bed in the depths, you are there. 9 If I rise on the wings of the dawn, if I settle on the far side of the sea, 10 even there your hand will guide me, your right hand will hold me fast. 11 If I say, “Surely the darkness will hide me and the light become night around me,” 12 even the darkness will not be dark to you; the night will shine like the day, for darkness is as light to you. 13 For you created my inmost being; you knit me together in my mother’s womb. 14 I praise you because I am fearfully and wonderfully made; your works are wonderful, I know that full well. 15 My frame was not hidden from you when I was made in the secret place. When I was woven together in the depths of the earth, 16 your eyes saw my unformed body. All the days ordained for me were written in your book before one of them came to be. 17 How precious to me are your thoughts, O God! How vast is the sum of them! 18 Were I to count them, they would outnumber the grains of sand. When I awake, I am still with you. 19 If only you would slay the wicked, O God! Away from me, you bloodthirsty men! 20 They speak of you with evil intent; your adversaries misuse your name. 21 Do I not hate those who hate you, O LORD, and abhorthose who rise up against you? 22 I have nothing but hatred for them; I count them my enemies. 23 Search me, O God, and know my heart; test me and know my anxious thoughts. 24 See if there is any offensive way in me, and lead me in the way everlasting. I’m an introvert. But I’m not a Misunderstood-Super-Special-Unicorn because I’m an introvert. Last year, there were so many blog posts about “how to take care of an introvert”, “what is an introvert”, and “what makes an introvert special”. They got on my nerves, even though I saw truth in the posts, because the posts glorified introversion to the detriment of extroverts. What is an introvert? Introverts recharge alone. Extroverts recharge with other people. Being an introvert doesn’t mean that you hate people. It means that being with people takes your energy instead of renewing it. I like extroverts. I’m married to an extrovert. Extroverts make my life better because they’re way more fun than I am. They help stretch me as a person because their perspective is so different than mine. Sometimes, the extroverts in my life don’t really get where I’m coming from, but, let’s face it, I don’t get them either. The Bible doesn’t say anything (to my knowledge) about how introverts just need the world to understand them better. The Bible does, however, talk about people being differently-gifted and how they should use those gifts to honor God (1 Cor. 12). No gift is more “special” than another, and God uses them all. So, introverts, it’s time to turn in that introvert gold-star. Most of these posts are focused on how other people can care for an introvert. “Make them a pillow fort and leave them alone” works sometimes, but the focus of the posts make it seem like introverts aren’t responsible for self-care. News-flash world: I’m an introvert, and if I need some alone time, I need to ask for it. If Husband-Man (one of the world’s biggest extroverts ever) needs to go out and be around humans, it’s his job to initiate that interaction. So how does an introvert take care of themselves without being self-indulgent? When you need alone time, take it. When your friend calls and asks you to hang out , if all of your “social-time” budget (IE, you’re full of people) has been maxed out, it’s okay to say “no” and ask to schedule for a different time. Side-note: Don’t flake on your commitments all the time. Hold true to your word and time commitments if you can. Use your alone time for good. Don’t spend it all in self-indulgent pursuits. Instead, focus on growing your relationship with God. I’m not saying don’t read for fun or have hobbies, but don’t spend all of your alone time on things that don’t have eternal ramifications. Get out of your own head. It’s really easy for me to think about what’s going on in my life, and to fixate on the negative. Then begins the downward spiral of self perpetuating sadness. The Bible tells us to “take every thought captive to obey Christ” (2 Cor. 5:10), and wallowing in self pity doesn’t fit that bill. Think about what’s going on in your life, and keep going. God is good even when you get caught up in your own head. God is good when things don’t look like they’re going your way (Romans 10:18-30). Get the heck out of the house. Make friends with some extroverts and go somewhere and do something out of the norm. Remember that part in the Bible that says to not neglect meeting together with other Christians (Heb. 10:25)? Introverts are not exempt. Get out there and be friends with people. Don’t hate on extroverts. They’re just as important as you are, and your life would be crazy boring without them. 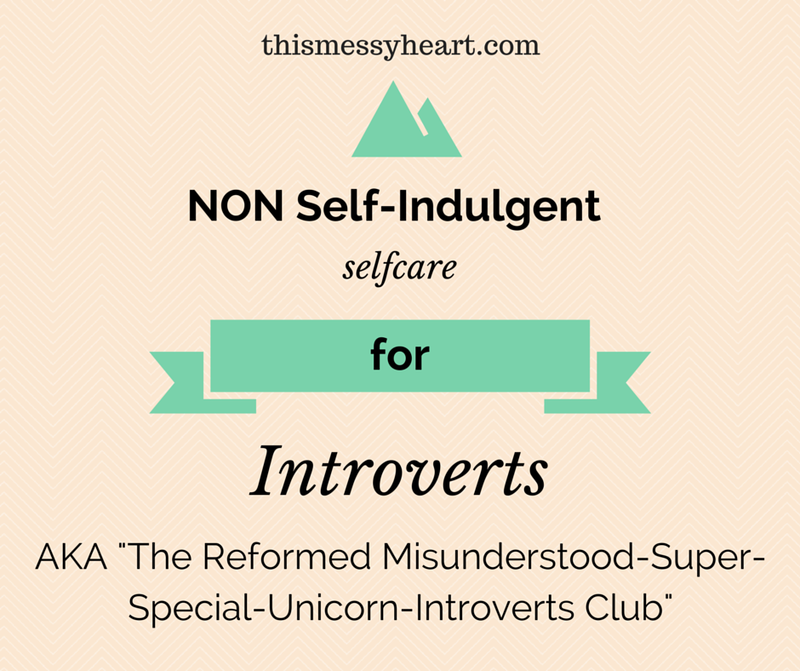 Who wants to form a Reformed Misunderstood-Super-Special-Unicorn-Introverts Club? I’ll be there. Even though it involves being around other people. Because that’s actually really good for me. I love to create. And what I love to create varies by the season of life in which I find myself. When money was tight and Husband-Man and I newly married, I crocheted hats for all of our family’s Christmas presents. These were, however, no ordinary hats. They were designed for each family member. One was a monster with horns and eyes, others were stylish and slouchy, and others still were super functional and warm. When studying business for a bachelors and masters degree, my art was the perfectly crafted resume or research paper. You may not find art in a visually pleasing and content rich document, but I do. I crafted it with my hands and mind, and it has the possibility to open doors of employment and avocation for many. When I got sick of all the business writing required of me as a student, I would sing. I sang with chamber and concert choirs, practicing an hour a day and performing at concerts and on tours. I relish the feeling of my voice blending with my neighbors, creating one voice to convey a message of peace, joy, hope, or sadness. When desperate and tired from illness and work, my art consisted of tear stained words that were sometimes legible, scribbled in a gorgeous leather journal. This past month, I haven’t been doing my art. And I’ve been miserable. My wrist still hasn’t healed well. I’m in and out of a brace, preventing me from cutting pieces for sewing, holding a needle to embroider, holding a book of music to sing, crocheting, writing by hand, and sometimes even typing. I’m not in terrible pain, but I’ve been told that rest is the only way my tendons can heal. I am not good at rest. I have NEVER been good at rest. I get antsy, and mean. I feel useless and unfulfilled. And sometimes, I have ignored my doctor’s orders for rest, and in desperation, have tried to create something. And I have been frustrated that my creation has been weak, like my wrist. What has God been teaching me? That is hard to say. I’ve spent this entire year waiting, so you’d think that this would be easy. But, my escape has been taken away from me. I can’t feel better by being creative in my normal ways. I can’t escape into a project and forget the world for a while. So, I have no where left to turn. My art, my creation, is not here to make me feel better, so there’s only one more place to turn. Even when your wrist is hurt, you can still lift your hands. My voice can still sing, and my mind can still study. It’s back to basics (with a lot of prayer for healing).